Towards the end of August, the roadsides of Eastern North Carolina are dotted with farmers hawking their final crops of the summer - peaches and corn. Peaches, corn and so many other beautiful vegetables come together to create this sweet, crunchy, simple salad. If you're not in the mood to turn the stove on - really fresh corn is also great raw! Per Serving: 167 calories; 10g fat; 19.3g carbohydrates; 3g protein; 0mg cholesterol; 1340mg sodium. This dish is simple and quintessentially summer with clear and bright flavors. I tossed it last-minute at a dinner party and my friends loved it. Perfect with grilled meat! I love this salad! 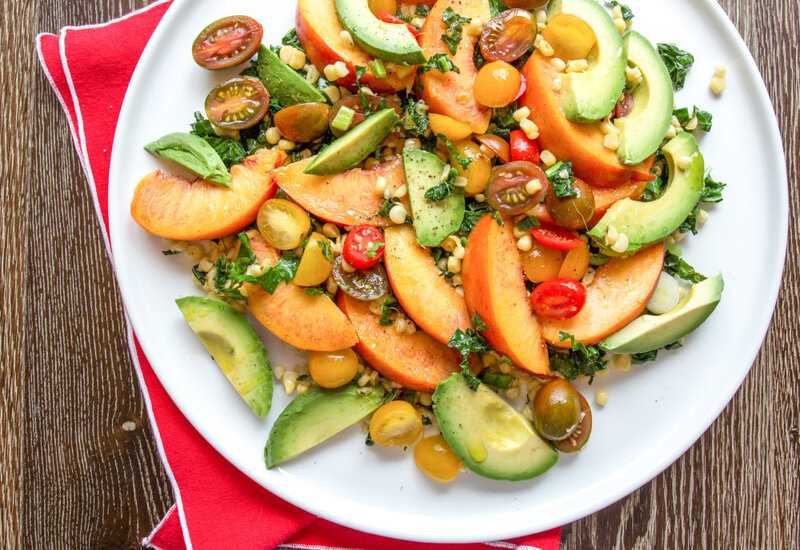 We grilled our peaches and corn to make this salad, and it was super delicious. Perfect dish! Beautiful salad, sweet and delicious flavors that's perfect for summer nights and get togethers. I used a peach instead of a nectarine, just personal preference, and I love the way it turned out. Couldn't find flaky sea salt anywhere. I was looking for Maldon specifically. Still good without it though. Served this with grilled steak and chimichurri sauce. Such a great salad. I used canned corned and added olives too. Couldn't find flaky sea salt, so I went with coarse sea salt. First time using raw corn, but so glad I did. This is a great recipe for my raw challenge diet I am doing with some friends. Also, I used spinach instead of kale.